The historic landscape area of Llangennith, Broughton and Hillend Burrows is a besanded landscape of some archaeological potential. The boundaries of the area are the mean high watermark and the inland extent of sand dune systems at Broughton, Llangennith and Hillend. The dune systems of the area are largely fixed through vegetation, though remain unstable along the periphery. The area bounds the cliffs at Burry Holmes and Rhossili, while the sands extend over the solid geology of the cliffs, themselves. Its particular historic landscape importance lies not in the present ground surface, but in the evidence for past land use preserved under the sands. Pre-medieval activity is represented mainly in finds scatters, but there are also sites from the Mesolithic, Bronze Age, Iron Age and Early Medieval period on nearby Burry Holms. Within the area itself a single definite prehistoric settlement site has been identified, an Iron Age enclosure (00031w); a rubble-faced enclosure wall of c.30m in diameter, enclosing c.0.07ha, with a possible entrance to the south. A wall, associated with midden material, extends to the southeast of the entrance. A further enclosure feature (00066w) has been identified slightly to the southeast, interpreted as a possible ringwork, this site is more likely the remains of a post-medieval sheepfold. 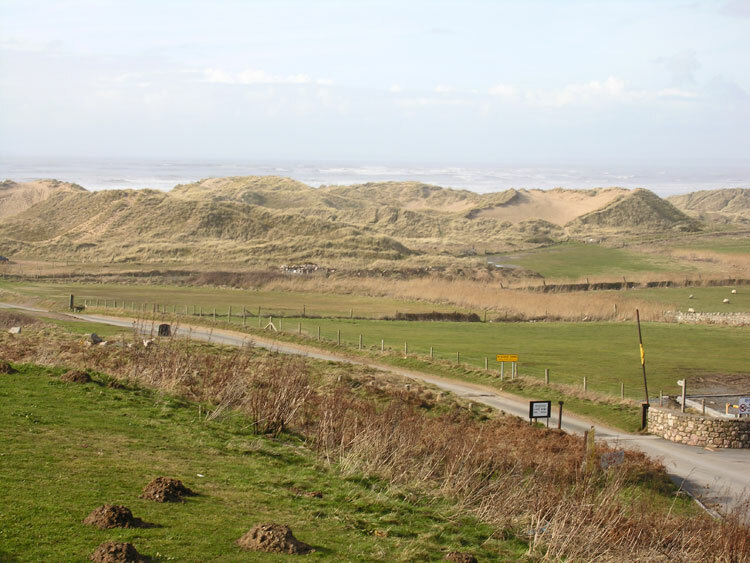 Little additional information is available about Llangennith, Broughton and Hillend Burrows; the considerable archaeological potential of the area is, however, emphasized by inference from adjacent areas. Within the adjacent area to the north is the prehistoric and early medieval settlement of Burry Holmes, and to the south, a besanded Medieval settlement, perhaps best described as Lower Rhossili, part of which was excavated in 1981, to reveal a church and part of a secular building. The secular building was constructed in an area, which had already been partly besanded and was presumably fixed dune at the time (Davidson et al 1987). 'Lower Rhossili' is traditionally regarded as the forerunner to the present settlement on the plateau overlooking the Burrows, but the results of the excavation, together with reconsideration of the documentary evidence, suggest that occupation in the two settlements overlapped (Toft 1985, 53-4). Under this revised interpretation, a thirteenth century date has been suggested for the foundation of both the upper and lower villages (Davidson et al 1987, 257-8), but there are possible grounds for considering that both are pre-Norman. Two of the Llandaff charters relate to adjoining estates, Lann Cingulan and Lann Gemei; Davies (1978, 135; 1979, 97, 124) suggests that Lann Cingulan was Rhossili. However, the topography fits best if Lann Cingulan is the Burrows, whose boundaries are given as 'between the two ditches towards the sea and upwards along the two ditches to the mountain along the Cecin, the boundary of Llan Gemei' (Evans 1893, 144, 369), and Lann Gemei is Rhossili village.